Smoke's Poutinerie is not just about fries, gravy and cheese curds. Instead, poutine here is all about overindulgence. Apparently I wasn't the only one makin' a b-line for Smoke's when they launched their first Toronto location. In fact, they got such a rush that they ran out of potatoes - they served 1,000 orders in the first 2 days of operation. Luckily, by the time I got there the kitchen had re-stocked (well for the most part - the current buzz being the pulled pork poutine is not to be missed but they'd long since sold out and weren't expecting anymore until the following week) and was busily dispensing fries in a steady flow to diners jonesing for their gravy 'n' curds fix. The menu has 15 different kinds of poutine, from the traditional to what would definitely qualify as 'out there' options; you can even mix and match and make your own. Slightly disappointed by our inability to augment our poutine with a pile of pulled pork we opted instead for the following: Butter Chicken Poutine, The Montreal (with smoked meat and mustard though I don't recall ours including the dill pickle slice mentioned on the chalk-board; $7.95), Bacon Poutine ($6.95), and Prime Rib Poutine (with shredded prime beef, carmelized onions and sautĂŠed mushrooms; $7.95). The bacon poutine was the closest we had to traditional poutine and gave us a good idea of how this establishment treats its spuds. The fries were fresh-cut, skin on with a crispiness that stood up well to the addition of various toppings, and the cheese curds (sourced I'm told from Quebec's Eastern Townships) were indeed pleasantly squeaky. The gravy itself was pleasant albeit lacking a little oomph (there was a depth of flavour missing that everyone at our table noticed...probably due to the fact that the gravy was produced with a combination of chicken and beef stock instead of the 100% beef variety that most poutine die-hards prefer). The addition of thin, crispy bits of smoky bacon definitely added a nice touch to the dish and was the unanimous winner for the night's best poutine. The Montreal and the Prime Rib were also pleasant enough too. Montreal's fries come draped with thinly shaved smoked meat an a dollop of yellow, ballpark mustard off to one side, providing a pleasantly sharp and spicy contrast to the gravy and curds. The presentation of the prime rib was a little surprising. A layer of finely chopped (allegedly) prime rib that was slightly dry in texture covered the spuds but definitely perked up well when mixed into the gravy. The sweetness from the onions and the mushrooms' earthiness were also pleasant additions to the flavour palate for this poutine. The most controversial and divisive dish of the bunch was the butter chicken poutine. I enjoyed it but my dining companions weren't too thrilled with it. Having lived in the UK I'll admit I've got a soft spot for curry on my fries. And Smoke's curry sauce is definitely a powerful blend of spices with a lovely sweet counterpoint to the chili heat in the sauce. As much as I enjoyed the sauce though, it overwhelmed the dish to the point where, were it not for the variety of poutine we ordered, I don't think I could've finished an entire serving myself. And the dry, tough chicken cubes could just as easily be left out of the dish altogether since they're not actually cooked in the sauce. Oh well, I suppose they can't all be winners, right? I asked owner/proprietor Ryan Smolkin a few questions about his inspiration and here's his take on what could be one of Toronto's few critic-proof dining establishments. What inspired you to start Smoke's? The main inspiration was to bring my love for poutine and my love for business together! I've had the concept in mind for years but have always been focused on other businesses. I had been laying low for a few months after the sale of my last company before drafting a business plan for this crazy venture. That coupled with poutine being a hot topic in the market as of late, made this a perfect time to launch the idea. I knew I would always regret it if it didn't give it a shot. 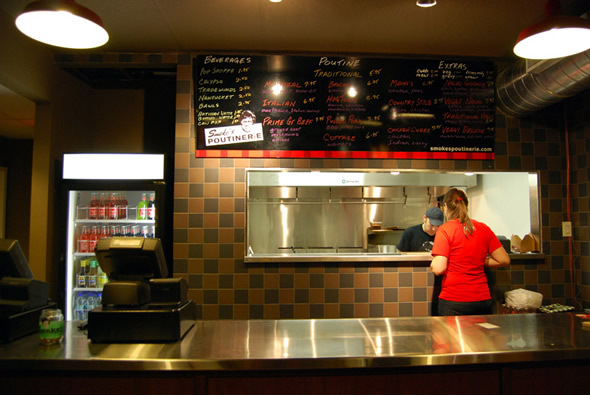 Where was your formative poutine experience? The best you've had? Montreal at La Banquise. Hands down my best poutine experience....until now of course!! Toronto has poutine options along a wide spectrum from the trucks at city hall to Jamie Kennedy's Foie Gras Poutine. Where do you see Smoke's along that line? Right in between and a whole lot more. We have the quality, custom, gourmet recipes like a Jamie Kennedy but the pricing of the trucks outside of city hall. Where the plus comes in is with the size and selection of poutine when you walk into Smoke's. We have started with 15 different types of poutine on the main menu but can mix and match with any of the ingredients and sauces we offer to custom build your own! 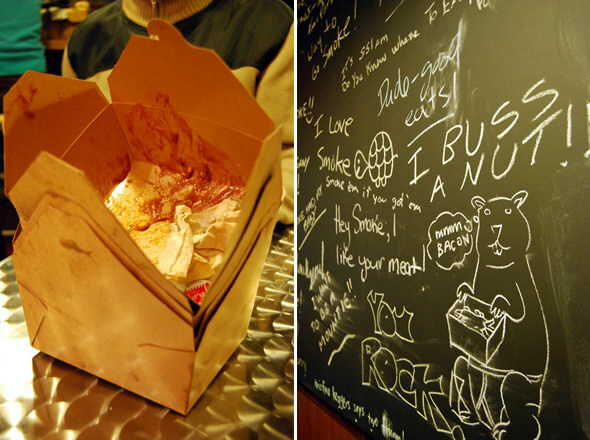 Why hasn't anyone thought of this (a Poutinerie in Toronto) before? It's clear we're pretty fond of it. Don't know. Seems simple enough. Just happy I'm the first one out and can always claim to be the original Poutinerie in Toronto? In our first 2 days of launch we served over 1000 poutine orders with nothing but great feedback, and believe it or not, repeat customers already! With this response and support, I plan on moving ahead with my expansion plans seen on our website, but at a very manageable pace so we don't jeopardize our product...our poutine quality will always come first! So keep your eyes on our website for future expansion plans. How important is the squeak? Very important. Have to have it. Must have curd and it must be fresh and squeaky or it ain't poutine. How would you describe poutine to someone who's never had it before? What distinguishes it from cheese fries with gravy? Poutine is a way of life!